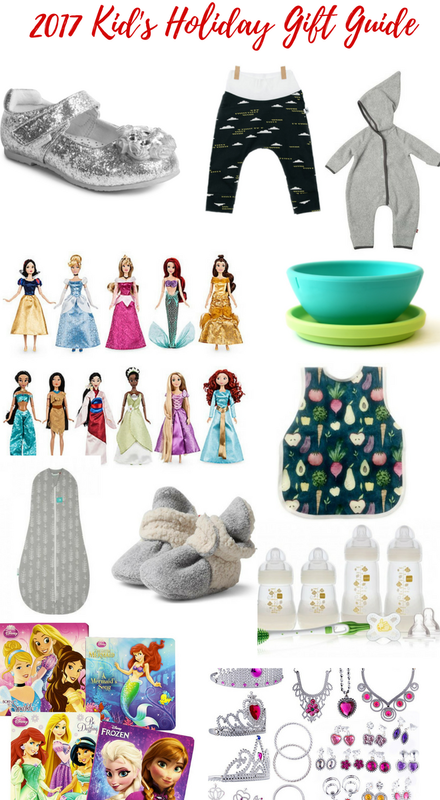 This gift guide is for babies and kids- some fun and some practical ideas! ***Keep reading for an awesome giveaway for two BapronBaby bibs, a Munch Mitt and 2 pairs of HOTBUNZ pants!! My kids have been wearing Zutano clothing for years and I love the cute patterns and quality. They have more items for babies but have some options that my 3 year old can wear as well. I love the furry vest and elf suit. Zutano is well known for their booties which are like little slippers that button right on your baby's feet. We have a few pairs of these and love them. Oliver is now wearing Adalyn's old ones so they certainly last a long time. Adalyn loves all sparkly shoes but these ones stand out to me because with other brands, the glitter rubs off easily and the shoes look very worn having a bare spot. these are coated with a clear coating so that the glitter doesn't rub off making them last much longer. When I opened them, I was so excited for a nicer glittery shoe since my child wears them all day, every day. Adalyn has been wearing Pediped shoes since she was born and we have always found them to be great quality. I asked Adalyn what she wanted from Santa this year and she told me dress up jewelry and crowns. This set looks awesome from Amazon! Less than $11 too! I have it in my cart and will most likely purchase it for Ada for Christmas. My babies are super messy eaters and I bet yours is too. I love this line of bibs for kids because they come in the cutest patterns. I love this fruit and vegetable apron of course but they have tons of other options as well. They can be worn from 6 months-3T. They are great for meals and for crafts and art projects. They are waterproof but the bib is soft, quick-drying and stain resistant. 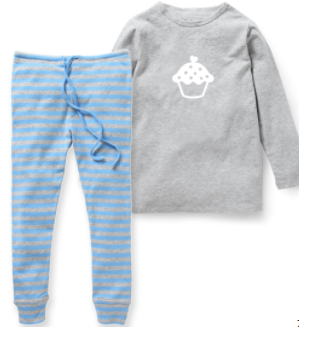 The one kind of clothing that I was having a hard time finding for Oliver was soft, comfy pants that I liked. He has a bunch of nice khakis and corduroy pants but needed some cozy ones for the cold months. I love these organic cotton pants from HOTBUNZ for him. they come in cute patterns- my favorite being the Head in the Clouds design. These are great for babies and toddlers, boys and girls as they run up to size 18-24 months. If you subscribe on their site, you will get 10% off your order. We love the Silikids products: especially the silicone placemats and bibs. These bibs hold up so well that we used them for two years for Adalyn and are now using them for Oliver and they are still in perfect shape. We are loving their new silicone bowls as well for the kids. They are great for snacks where Adalyn has to hold her own bowl and I don't want to give her a glass one. Adalyn got a set similar to this one last year for Christmas and while it took her a bit to get into it, these are one of her very favorite things right now. We love all things princess around here. I love that the description of these says "difficult to escape from". I don't know about you but both of my babies can escape from a swaddle so quickly and then they cry because they don't really want to escape from it. These are great because they are available for different seasons: heavier ones are for winter and lightweight is for summer. Perfect! These would make a great gift for someone with a baby. We have a teething baby over here and the Munch Mitt is perfect for him to chew on when he is teething. It fits right on baby's hand so they do not drop it and comes in all different colors. Again with the princesses! Adalyn loves to read and would freak out getting princess books! Personalized pajamas for the kids? I'm sold! I love all things personalized and got a pink pair for my daughter and a blue pair for my son. These will be perfect for Christmas morning and having the kids match. Now, I just need to find some for mom and dad! I love this set because it comes with a little of everything: bottles, pacifiers and a bottle cleaning brush. This would be great for a mama to be or for someone who has a very young baby. This set is gender neutral which is nice in case the parent does not know the set of the baby yet. The giveaway will be for your choice of two BapronBaby bibs, a Munch Mitt and 2 pairs of HOTBUNZ pants! Disclosure: I received some of these products as a sample to review. All opinions are my own. I’m most excited about celebrating Christmas with my newborn and my oldest kids and being with my family. Thank you! I am most excited to see my nieces! I haven't seen them all year and miss them. I am excited that my son who is in the military is coming home for Christmas! I am excited that my son will be home for a visit.